Travels with a Tin Donkey: Volta Limburg Classic! One of my great memories of cycling in Europe was the various times I rode in the Netherlands in the Limburg region. In addition to twice riding the Amstel Gold course (the 150 km version; once during the official event and once with friends a few weeks later in better weather), the 2012 World's time trial course as well as the World's Toertocht (sportif) ride that year. 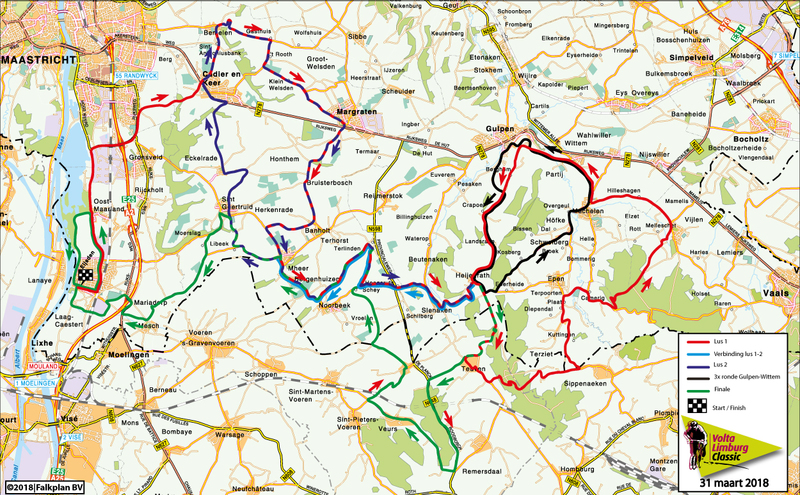 Today the Volta Limburg Classic, a UCI 1.1 level race, is taking place in the region. Also known as De Hel van Het Mergelland, it has been run since 1973, receiving its current UCI status in 2005 and today is the 44th edition (the race was not run in 2001 due to the foot-and-mouth crisis in rural Europe). 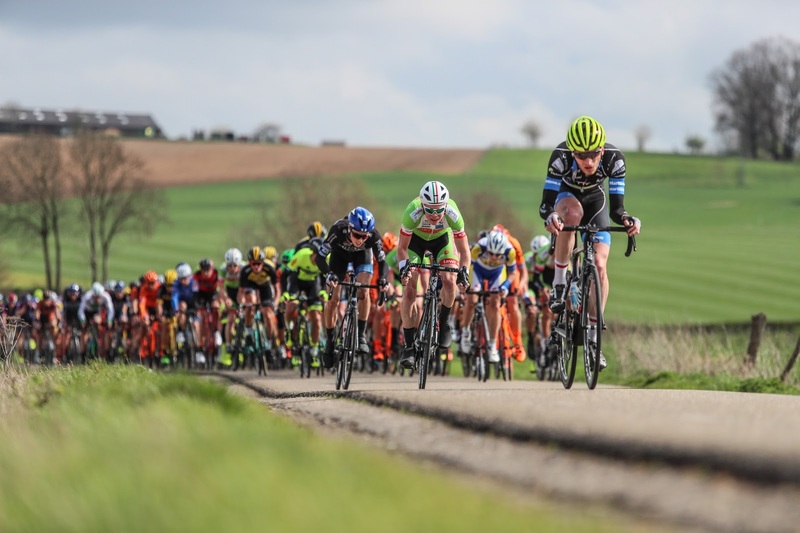 As it is shortly before the Tour of Flanders, it is more of a race for up-and-comers rather than the top pros, although sometimes UCI WorldTour pro teams are present. Jumbo-Lotto NL is on the start list in 2018 but the rest of the participants appear to be from UCI Pro Continental and Continental teams. I have not heard of most of them, which also makes things interesting. "Monkey Town Continental Team," anyone? Past winners have included Tony Martin in 2008 and Stefan Küng, a rising Swiss pro with Team BMC, in 2015. From an entirely Dutch/Belgian event in its early days, the race has become much more international, with winners from Australia, Germany, Italy, Russia, France, Ukraine, as well as those other two nations. I see a Canadian, Benjamin Perry, of St. Catherines, Ontario, is present today for the Israel Cycling Academy team. span style="font-family: inherit;">People tend to think of the Netherlands as flat as a pancake but this region, as I discovered, boasts the "Limburger Alps," a whole lot of brutal little hills that really hurt! 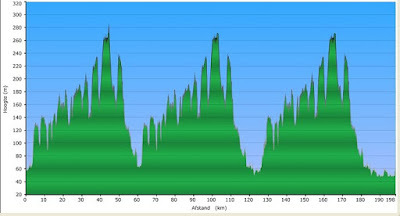 The course today is just under 200 kms and makes my legs hurt to look at the profile! Thanks to the magic that is the Internet, it is possible now to watch these races live (although I will need to brush up on my Dutch) and I will pass a happy Saturday enjoying the familiar scenery in preparation for tomorrow's Tour of Flanders. 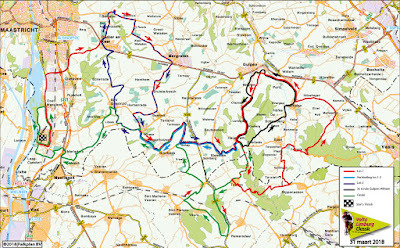 Limburg L1 television's broadcast coverage includes the women's race as well as the men's. For Dutch fans, here is the link to the event's website. There is also a Toertocht version on Easter Monday.